Well, the kid was off school today so we enjoyed sleeping in, followed by a big bowl of warm Cream of Wheat. Almost as good as when my mom would make it on cold morning for us but I think she used a lot more butter. We have spent the day in our jammies, total bliss. We watched some Survivor since the kid had a homework assignment that required it. What if we were one of those families that didn't watch TV? How would he ever understand Lord of The Flies without Survivor? I am still keeping busy making stuff for my Etsy Shoppe and just for fun. I even made a December 2009 mini album to document this holiday season. The December Daily project is just too much pressure, but I thought this was a happy compromise. When I get a few pages done, I'll post it. 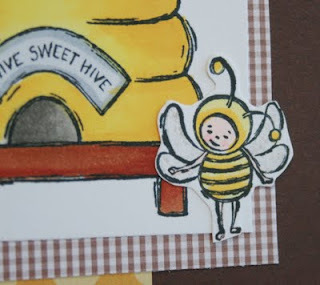 Here's a sweet little card made with an image I got from my stamping group over a year ago! Isn't it a cute stamp? I may head over to the One of a Kind Show tomorrow, downtown while the kid is at the Nerd Academy. Lord knows I don't have any money to spend but I love seeing what everyone else is making these days. And btw... I am not the only one who is a major blog slacker, I got half way thru my bloglines to find many, many bloggers with their last posts being in April or earlier! I am still catching up, so I will "see" many of you soon! Glad you are back blogging Simone. I am bad as I haven't really blogged but must start back up. Did you sell your shop? Sounds like lots going on in your world. I sure have missed your fun posts. Keep it up. 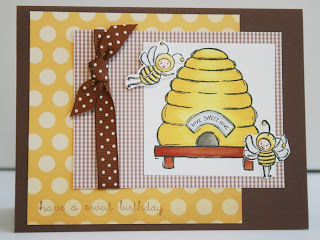 This card reminds me of Joanne......guess because it's been so long since we've stamped together! Cute! now I'm picking my jaw up off the floor! 2 days posting in a row!!! woohoo! missed hearing your crazy stories. 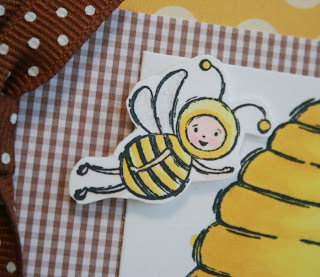 I love that stamp set but have a hard time with it, but your card is adorable! TOO adorable! SO nice to see ya bloggin' again! How's life been treatin ya? so glad to "see" you Simone! I don't blog anymore, no one read it, or commented. I do however enjoy talking to myself. Wherever life takes you, may it be a good place for you.